I have been curious about this part of the Pyrenees for years. The Tour de France often comes through this area. It is peppered with Cols and I wanted to see what the area was about. I had found the cycling guest house where I am currently staying online. Funny thing is the Irish lads that I met at Paddy & Olive's cycling guest house La Lanterne Rouge, where coming here directly from Saint Savin. Bill Field, whom I also met at La Lanterne Rouge, had been here last year. Now it was my turn. Le Deux Velos was purchased two years ago by a really nice Dutch couple. Elma is an artist and a fantastic cook. Mark has been working hard to renovate the old quirky farm house. Right now you won't have a private bath, shower or sink in every room, but they are working on this. It is also on the road to Massat, and so it is a bit noisy with car traffic. That said, both of them have lots of ideas to improve the property and are very happy to be living here (well, except for the fact that they are missing out on the celebration at home for the Dutch being in the World Cup Finals). Last night we enjoyed a delicious meal out on the patio (above), and then Elma and I walked 45 minutes up the steep hill behind their guest house to the home of some friends of theirs. Mark had driven up earlier to watch the World Cup soccer match with 4 other friends. Of course the Nederlands National Football team won. Everyone celebrated with champagne exhausted from hours our cheering for their team. They were so happy. I sat among them as they enjoyed each others company and spoke French, Dutch, and a English all mixed together. Today's ride was hot, and very green. I laughed when I saw the sign that said that I was on the Route du Cols. It seems they have a route du everthing over here. Today I was on part of the route that is included in the Raid Pyrenee. 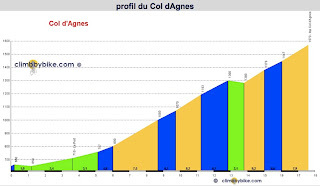 I rode from Biert to Massat and climbed the Col d'Agnes (which had lots of names painted on the road at the top, and horrendous gravel for most of the climb, do not descend down to Massat from Col d'Agnes, at least until the gravel settles, even though the ascent up from Aulus-les-Bains is rated as a better climb). I then climbed the Col de Latraup, and looped back to Biert. This area has tougher riding than I expected. The valleys are dramatically steep, almost like Switzerland, the descents seem to take forever. Seix was a nice town along the loop route back. Tonight I had what could be one of the best meals I have ever had in my life prepared by Elma. It was fantastic. The evening cooled off a bit and we were able to enjoy a meal outside in the back field, and then had some fresh mint tea from the garden and watched the World Cup football match (on the laptop, at the patio table). Fun. Tomorrow if it is this hot again, I am sitting in the river with a beer all day. * I was happy to see Cancellara in yellow in the Tour de France, but bummed that Franck Schleck is out of the Tour. I have always enjoyed seeing the Brothers Schleck compete together in the Tour de France.